Bristol-based multi-instrumentalist producer and visual artist She Makes War rocks up to the Brudenell Social Club, in Leeds, on Thursday, October 18. The alias of Bristolian femme fatale and DIY alt-rocker Laura Kidd, She Makes War has released her latest album, ‘Brace For Impact’, this week and will be playing tracks from it at the Leeds show, which opens her national tour. Crunching indie-rock with bite and beauty, She Makes War comes recommended for fans of Garbage, The Breeders and Wolf Alice. Laura said: “It’s about photography as a reflex, the way people overshare online and how when we die our online profiles just stay there. On her new album, she explained: “After finding myself in a happy relationship after a long period of sadness, this record enabled me to ruminate and find ways of creating beauty where there was once pain. The album naming decision was as dramatic as the music itself, coming after she broke her foot moments before supporting The Brian Jonestown Massacre. With barely enough time to visit A&E, a face full of glitter and steely resolve, she performed a slew of summer festival sets and a BBC 6Music Marc Riley session sporting a fetching knee crutch. Laura added: “Having my mobility stolen from me was exhausting and depressing. I’d come up with the album title while driving on tour, daydreaming about what it must be like to be in a high-speed car crash. 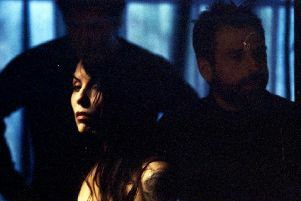 She Makes War has built a strong following, having played over 600 shows in the UK and Europe and receiving extensive online acclaim plus support from BBC 6 Music. Her last album Direction Of Travel earned plays from Steve Lamacq, Tom Robinson, Chris Hawkins, Lauren Laverne and Gideon Coe, as well as John Kennedy at Radio X and Alex Baker at Kerrang. A fiercely devoted, independent DIY force, She Makes War has crafted her success from a close relationship with fans, placing importance on her music’s physical form and an emphasis on the live experience. Equally at home playing heartbreaking pin-drop solo sets and fronting her explosive five piece band, she brings the experience back to its core by constantly finding new ways of communicating songs to people, striving to make art a part of the fabric of everyday life.